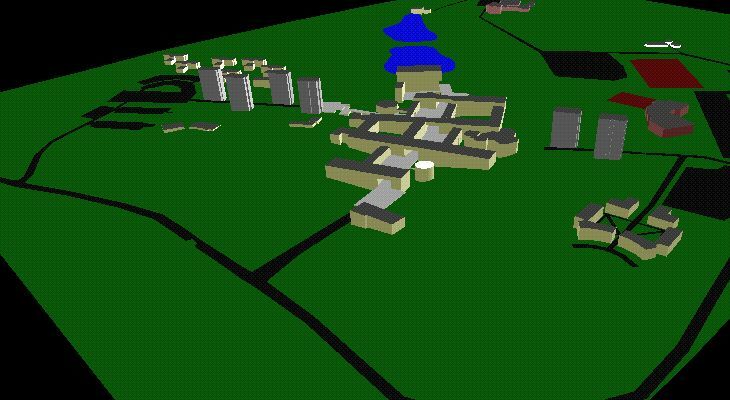 If you have a WWW viewer that understands the Virtual Reality Modeling Language (VRML), you can look at a model of the Essex campus. Clicking on many of the buildings selects individual departments' Web pages, the Library information system, the Sports Centre on-line system, and so on. For those of you without VRML viewers, here are an aerial view of the campus and a roughly similar view of the model. You might be interested to know that Essex was the first academic institution anywhere in the world to produce a VRML interface to its campus-wide information system. 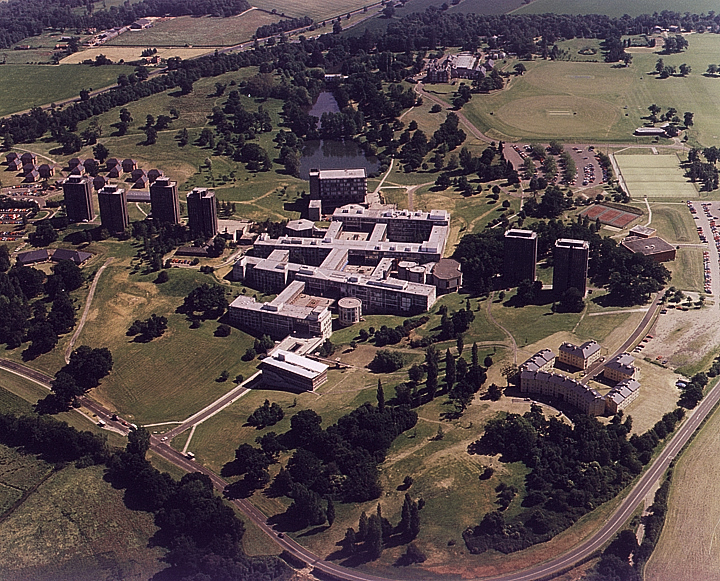 The University of Essex is situated in Colchester, famous for being the capital of Britain in Roman times and Britain's oldest recorded town. The University stands in Wivenhoe Park, 200 acres of parkland, which were formerly associated with the historic Wivenhoe House, perhaps best known outside the University as the subject of a painting by the architypical British artist, John Constable. (Wivenhoe House is now the University's conference centre, and serves a pretty keen lunch.) The main campus buildings are arranged around a series of open courtyards and pedestrian squares, connected by flights of shallow stairs. Around these lie residential accommodation and sports facilities. The VRML model was constructed in three stages. Firstly, a digital elevation model (DEM) of Wivenhoe Park was constructed from an accurate contour map. Secondly, architect's plans of the buildings were used to define their layout in a concise form. Finally, a script was written in the Tcl programming language to convert the DEM to a polygonal VRML representation, to convert the floor plans to buildings with sides that intersect the ground correctly, have roofs, and so on. The same script also arranges the lighting. You should be aware that the model is rather schematic: ramps replace the staircases between sqaures, the apex roofs of several buildings have been replaced with flat ones, and so on. Also, roads and lakes are represented by polygons floating a metre above the ground, sometimes exposing defects in the VRML renderers! However, these simplifications do allow the entire model to be represented in only couple of thousand polygons, making it quite fast to download. The modelling process (by far the hardest part) was carried out by Dr Christine Clark; the conversion script was thrown together by Dr Adrian F. Clark. The development of the model was done partially to learn VRML (it had only been around for a couple of weeks when we did it) and partially to demonstrate to our colleagues the possibilities offered by virtual reality. The existence of the VASE Laboratory is partially a result of this demonstration. This cookie-free website is © University of Essex. This page was last updated at 2017-04-07 09:32:40.